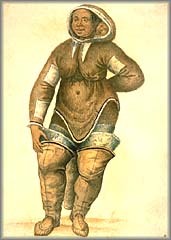 e do not know the names of the three Inuit hostages that Frobisher brought to England in 1577. The man's name is usually recorded in English as "Calichough." 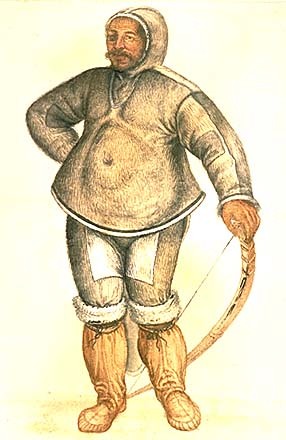 The woman's name ("Ignorth") and that of the infant ("Nutiok") are simply versions of the Inuit words for "woman" and "child." The three captives were a great attraction when they landed at Bristol in the autumn of 1577. Their portraits were painted several times but only one set of paintings has survived. These watercolour portraits were painted by the noted artist John White who would later be governor of the Virginia Colony. 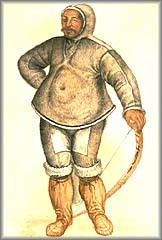 At a reception held by the Mayor of Bristol, the Inuit man demonstrated the use of his kayak and bird-spear to hunt ducks on the Avon River. The occasion was recorded by an artist, and versions of the resulting engraving were published in many European countries. This imaginative engraving of Inuit life was used to illustrate an account of Frobisher's 1577 voyage. 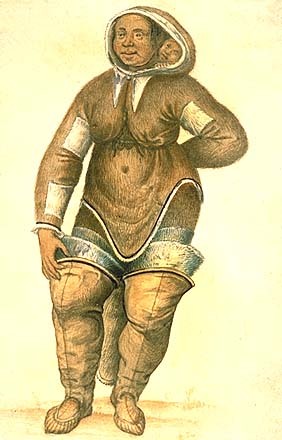 The original drawing may have been based on the Inuit hostages in Bristol. "1577. Captaine Frobisher in a ship of our queenes of the burden of 200 tonnes came into Kingrode from Cattai, who brought certaine oare from thence, which was esteemed to be very ritch and full of gowld....They brought likewise a man called Callicho and a woman named Ignorth. They were sauage people and fed only uppon raw flesh. The 9th. 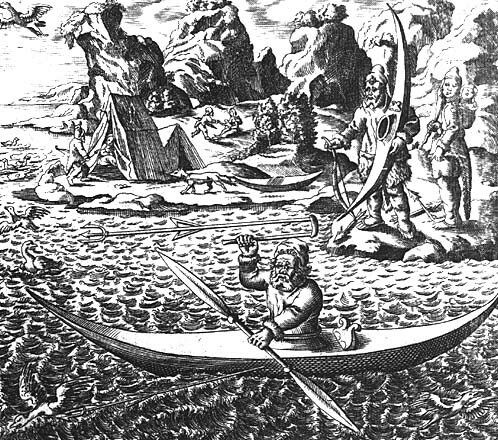 of October he rode in a little bote made of skinne in the water at the backe, where he killed 2 duckes with a dart, and when he had done carried his bote through the marsh upon his back. The like he did at the weare and other places, where many beheld him. He would hit a ducke a good distance of and not misse. They died here within a month."